Will third quarter earnings kill the stock market rally? 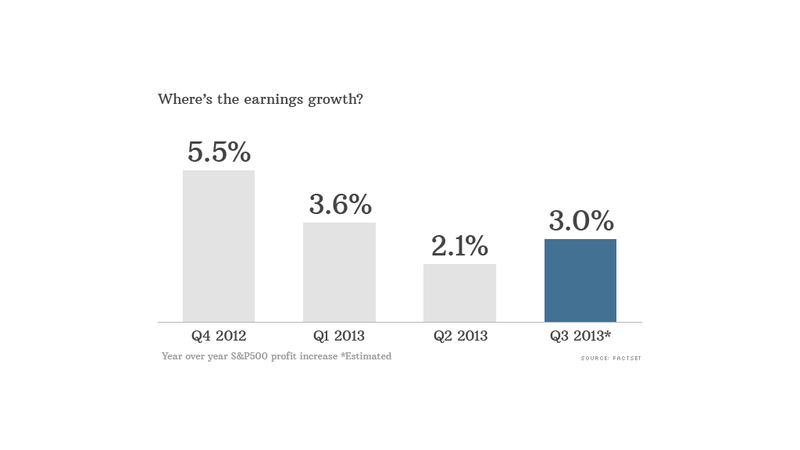 Earnings have been lackluster for the past year. Some strategists say this may finally catch up with stocks. 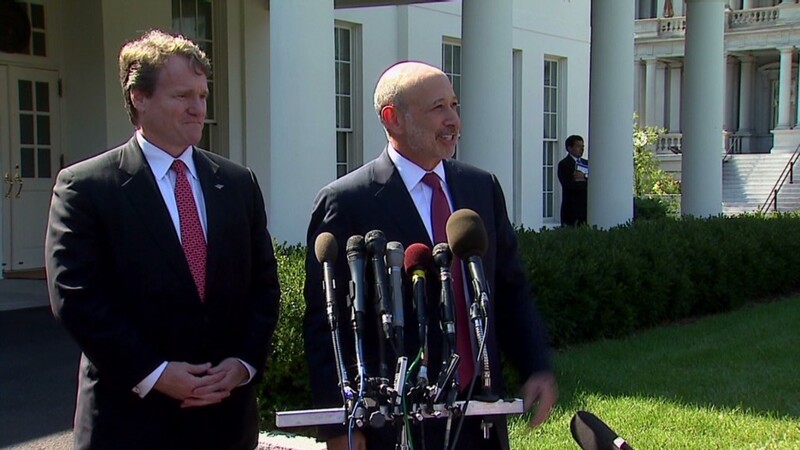 The U.S. government isn't the only threat to the stock market. Third quarter earnings are expected to underwhelm investors who have pushed up the market to record highs this year. Many high profile companies have already been downgrading their forecasts for the quarter. According to research from FactSet, 90 S&P 500 companies have lowered expectations for the third quarter. FactSet said that's the most companies to issue earnings warnings for a quarter since the company started tracking these figures in 2006. Some of the companies to cut their outlooks? Retailers Target (TGT) and Abercrombie & Fitch (ANF), railroad owner Union Pacific (UNP), software developer Autodesk (ADSK) and Chef Boyardee owner ConAgra Foods (CAG). Overall, earnings for the S&P 500 are expected to rise just 3% for the quarter. While that's roughly in line with the earnings growth for the past few quarters, several analysts think that weak results might give investors a reason to stop buying stocks. The stock market isn't cheap right now. Using one key metric of the stock market's value -- price to earnings multiples -- the S&P 500 is currently trading at 15.4 times expected 2013 earnings. That's a higher valuation than what the market was trading at in 2011 and 2012. This means that profits haven't been rising as quickly as stock prices. Komal Sri-Kumar, President of Sri-Kumar Global Strategies, expects third-quarter earnings to miss the already low expectations. And if that happens, investors will be likely to question whether stocks are really worth it at current prices. "By mid-October, we could see that companies are suddenly valued much higher than we thought they were," he said. Dan Suzuki, an equity analyst at Bank of America Merrill Lynch, expects that financial stocks, which have been a driver of profit growth over the past few quarters, will suddenly be a drag on corporate earnings. Huge legal tabs and a slowdown in trading and mortgage refinancing is expected to take a toll on bank profits in the third quarter. JPMorgan Chase (JPM) and Wells Fargo (WFC) will release earnings on Friday. But some analysts think stocks can continue to rally despite poor earnings. After all, stocks have defied the bears throughout the year. "Last quarter wasn't good but it was good enough for stocks to keep going higher," said Dan Greenhaus, equity strategist at BTIG. "We could have a not great earnings season, and stocks could still go higher." For many investors, U.S. stocks still look more attractive than other assets like bonds, commodities and international equities. Warren Koontz, a portfolio manager at Loomis Sayles, says there's simply no good alternative to U.S. stocks. Sooner or later, interest rates will rise further, which will hurt investors in the bond market, Koontz explained. He is also worried about headwinds in Japan, Europe and emerging markets. Even if third quarter earnings are worse than expected, Suzuki thinks stocks are a buy for the long-term because earnings growth should return by early 2014. Still, the consensus estimate for next year is for S&P 500 profits to rise 9% from 2013. That may be better than the current growth rate. But it still seems low for a market that's not too far from all-time highs.